1. Ultimately photographs are about: light, color and gesture. As the artist, I must decide which one is the most important and then work the scene to produce a photo that extracts the element(s) that are important. 2. Gesture is not limited to just people. Everything has gesture. Gesture, in essence, is what makes something unique. Something worth photographing—texture, smoothness, position within its surroundings, etc. And gesture always trumps light and color. If I get the gesture right, light and color will just be supporting actors within the photo. 3. I am responsible for every pixel within my frame. It is up to me to select what will be within the photo and what will be outside the photo. I must take care to make sure that the photo is framed as I want it. 4. You must work the scene. I was standing in front of one of Jay’s photos that I really like when Jay walked up. Me: In three shots, you got that. Jay: Yes. I went there and fired off three shots and that is what I got. Of course I had been to that location fifty different times, tried for what you see here and I got NOTHING! 5. You must be your own severest critic. If you are your own severest critic you will always be looking for that next “portfolio shot”, that next “totally different look”, etc. Today’s shot is about two things: the gesture of the beams under the FDR Expressway and working the situation. The photo was taken early one morning while I was out walking. 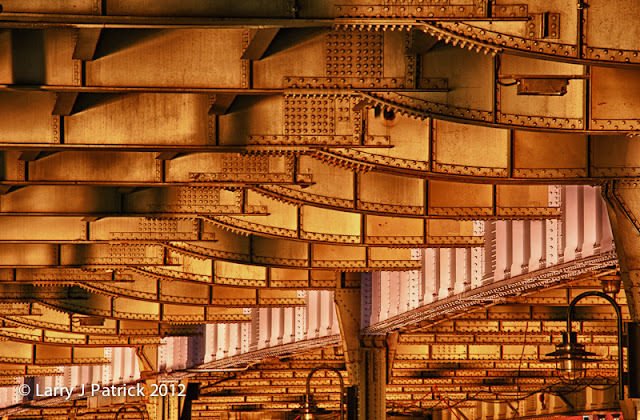 I loved the way that the early morning light showed-off the texture, the rhythm and the complexity of the beams. Because of the dynamic range of the scene I knew that I would have to resort to HDR, so I shot three shots (-2, 0 and +2 EV). I took four different sets of shots and then moved on. In hindsight, I realize that there was much more to this scene than I appreciated at the time. I should have worked the scene much longer and harder. The photograph is nice but it is not a game changer. I should have not settled for anything less than a game changer. Interesting photo. Was it so striking that you knew there was a photo there or was it something that you thought was there? I have walked under this section of the FDR many times and not seen this. Thanks for making me look more closely.